Your podcast feed, [ my feed URL] was successfully added and is now under review. I will let you all know when it goes live and you can acquire it via iTunes’ Podcast app or any other app that subscribes to that service. I may submit it to a couple of other services, but basically about everyone uses iTunes’ feed. 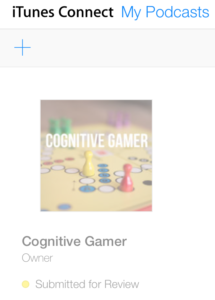 Oh, if you want to listen now, you can just click the Podcasts link in the menu above and get it that way… But, hopefully in the next 2-3 days (Apple’s review process takes a little while) it will appear in podcast feeds everywhere. This entry was posted in startup by Steve. Bookmark the permalink.